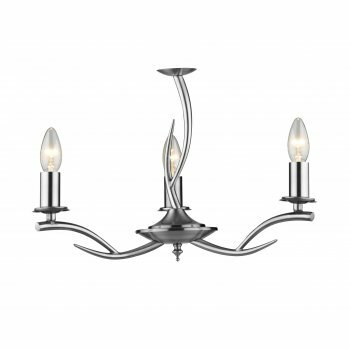 Dar Lighting Elka 3 light multi-arm ceiling fitting features a circular design ceiling plate with a modern, antler inspired ,3 arm frame in satin chrome finish, holding candle style lamps. The product code for this Dar ceiling fitting is ELK0346. Height adjustable at the point of installation. Double insulated. This modern design will sit well in both mdoern or traditional styled decors and the satin chrome finish adds to the elegant look. The Elka range is also available in antique brass finish and includes a 2 light wall fitting, a 5 light multi-arm ceiling fitting and a table lamp, which can be viewed on our website.